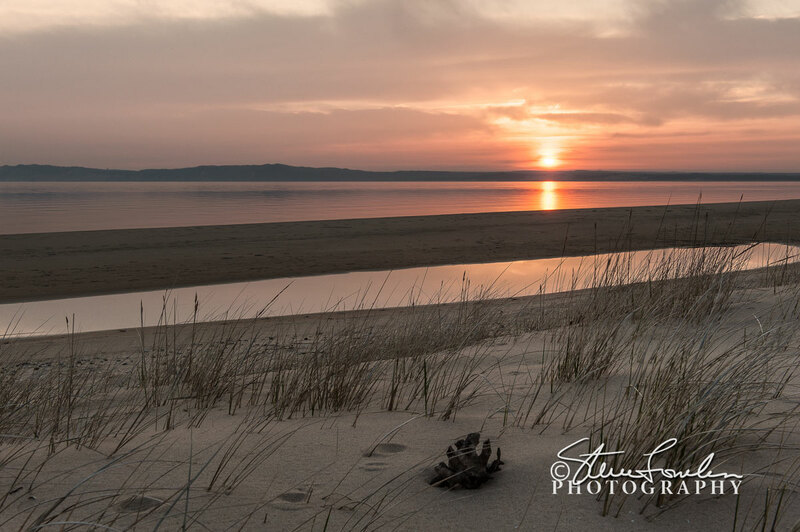 The mouth of the Platte River where it empties into Platte bay on Lake Michigan in Benzie County is a favorite place of mine for a sunrise. The sun usually rises right off the mouth of the river so you get a nice directional composition. At some times of the year there are a lot of fishermen that launch their boats at the park here and there is a non stop stream of boats and fishermen on the river and a lot of people on the banks. I suppose that could make a nice photo too but i prefer the solitude of the river and the lake with few people around. This is a two shot panoramic stitch with a Nikon D700, 24-70mm lens, processed in Adobe Bridge and adjusted Photoshop CS6.. This is a shot just down the beach from where the Platte River enters Lake Michigan. There was a small pool of water and I framed this shot with a knuckle of wind worn wood from a tree in the foreground. It was a lovely and warm sunrise for this time of year. Nikon D700 with a 14-24mm lens, processed in Adobe Bridge and adjusted Photoshop CS6.